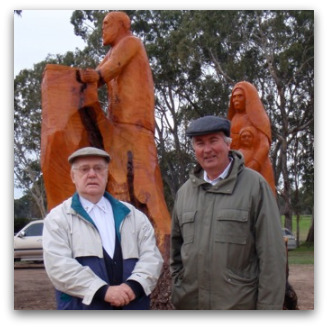 On Sunday hundreds of people gathered in Penola, South Australia, to commemorate a park to the memory of a remarkable priest, Julian Tenison Woods, who travelled Australia extensively in his all too brief life (he died before his 57th birthday). Speakers at the event attested Woods' great contribution to science, to Catholic education in South Australia, and to the development of the Sisters of St Joseph. I went to acknowledge his relationship with the Jesuits, his concern for the plight of Indigenous Australians, and his contribution to the fledgling church in remoter parts of Australia where new migrants were doing it tough trying to live a life of faith and service. Woods' early attempts at religious life took him to the Passionists and the Marists. Only after migrating to Australia and deciding to seek out his brother in Adelaide did he make sustained contact with the Jesuits — at Sevenhill in the Clare Valley. Fr Tappeiner SJ accompanied him on the path to prompt ordination. He befriended Fr John Hinteroecker SJ who, like Woods, was a very European naturalist. These two made scientific expeditions together and maintained contact until Hinteroecker died in 1872. In later years Woods became suspicious of Jesuit spirituality which he thought diluted the original vision of poverty and obedience of the Sisters of St Joseph. But he always held the Jesuits he knew in high regard. During his ten years at Penola, Woods encountered the plight of Aboriginal Australians in the 19th century colonial Australian bush. During his last year there, the Border Watch sent a correspondent to report on the situation in Penola. The correspondent reported on the three major grievances of the local community as expressed by Woods. The main complaint pertained to the mail delivery service. The third — education — Woods would later address once he was transferred to Adelaide as Director of Catholic Education for the colony. But the second grievance concerned 'the state of the aboriginal population, which I am assured is a disgrace to a Christian community'. Although he claimed that 'the blacks will be degraded no matter what we do, because they are savages', he noted that 'if they were degraded before, we have degraded them more'. He implored the 'good Christian people of Adelaide' who 'wish your names to go down to posterity with something better than execration for your treatment of this fast-fading race' to 'do something for them in the name of God'. His first major biographer, the Jesuit George O'Neill wrote in 1929: '[Woods'] experiences with the aborigines were, however, not numerous or remarkable'. When Woods was no longer welcome in the south, he came and conducted many scientific expeditions and parish missions in Queensland. He passed through Maryborough on about 10 occasions between 1872 and 1881. In Maryborough there happened to reside an Irish widow Annie Brennan, who had arrived there in 1863 on board the David McIvor with her five children, including Martin, then aged 11. In February 1881, Woods conducted a parish mission in Maryborough over many days. Family folklore has it that he got Martin Brennan, now aged in his late 20s, off the grog and back to church. Martin was my great-grandfather. My grandfather was then born almost four years later. The effects of the mission must have been long lasting as my grandfather was named Frank Tenison Brennan, as am I. I can only presume that ours is not the only Catholic family in Australia owing an inter-generational debt to the peripatetic priest scientist who always combined scientific inquiry with sacramental service in the most remote parts of the country. May Tenison Woods long speak to us at the interface between science and spirituality, with a passion for justice and a surety 'that better days are in store' for all, including Aboriginal Australians and new migrants like Annie Brennan and her kids seeking a fresh start. Frank Brennan SJ is professor of law at the Australian Catholic University and Adjunct Professor at the Australian National University. The statues at the Julian Tenison Woods Park, carved from the trunks of pine trees planted in 1951, were unveiled and blessed on Sunday by Archbishop Phillip Wilson. The full text of Fr Brennan's address is available here. Pictured: Fr Brennan with Fr Paul Gardiner SJ at the unveiling. Goes to show how good works can travel across generations. "Woods became suspicious of Jesuit spirituality" Tenison Woods would not have been the first catholic, clerical or lay, to become suspicious of the Jesuits and their particular approach to Christ-centred spirituality. Which is not surprising since Jesus himself was accused of eating and drinking with publicans and sinners. Something the men of the Law, the Pharisees would never do. Although it must be said that nowhere is it recorded that Jesus ate or drank to excess -no matter what the occasion. I wonder how those early Austrian Jesuits survived in South Australia in the second half of the 19th century. I'd say the practice of poverty would have been pretty real for men from the rich agricultural pastures of their motherland. What is "suspicious of Jesuit spirituality"? Many Catholics complained Carl Williams was allowed burial in a Catholic Church. Some victims of sexual abuse were angry that bishops and priests glorified the funeral of a priest who had been charged with sexual abuse. These responses reflect a changing understanding of funerals in the Church.